You are here: Virgin Islands News Online » News » Sabrett Beef Franks contaminated with bone fragments, extraneous materials! Sabrett Beef Franks contaminated with bone fragments, extraneous materials! ROAD TOWN, Tortola, VI - Consumers of sausages are put on high alert following the recall of Sabrett Beef Franks by the Environmental Health Division for contamination with bone fragments and the possibility that it may contain other materials. In a release from the Government Information and Public Relations Office today August 1, 2017, the Environmental Health Division is urging persons who purchased the product not to consume any of it, to return it to the place of purchase or throw it out immediately. 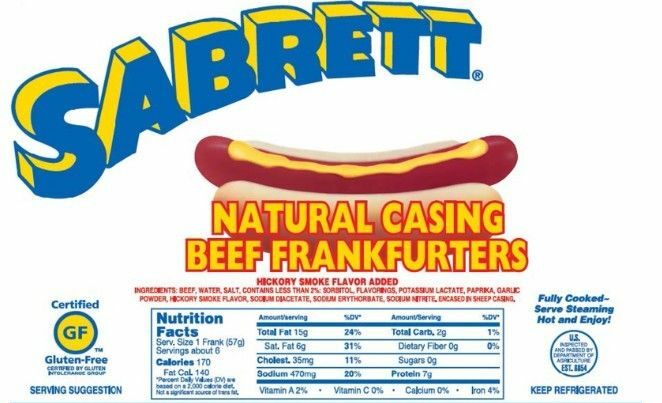 The recall is particuarly to Sabrett Beef Franks BS (8/1), EST/PLANT NUMBER 8854. According to Acting Chief Environmental Health Officer, Mr Minchington Israel, the USDA Mark of Inspection product was imported into the Territory by A Value Ltd. of Huntum's Ghut. Following inspection at A Value Ltd, it was verified that the Beef Frank was received by the supermarket and sold out to unknown persons, according to Mr Israel. Mr. Israel also advised that if anyone is concerned about oral injury or illness associated with the said Sarbrett Beef Franks that they should consult a healthcare provider. Persons are encouraged to contact the Environmental Health Division at 468-5110 with any questions. Since July 15, 2017, a report was carried on CNN, the International American news network, on the overall recall which covers 7.1 million pounds of beef and pork hot dogs, sausages and salami. According to the company's website, www.sabrett.com, the recall was initiated after customers reported small pieces of bone and cartilage being found in the products. "At that time, staff immediately investigated and identified an issue that could have allowed this to occur, and an equipment installation issue was quickly addressed," the website states. Meanwhile, Sabrett said it has been working closely with the USDA to effectively communicate to its customers with regards to this recall and to assure those customers that the recalled products are no longer in stores. surprised. It is a well known export practice by corporations of many super exporting nations to package contaminated and inferior products to "third world" countries. We must be always vigilant. We really need to be mindful,l. If this wasn't on CNN would we have even known about it? When deliberate food tampering (GMO) is standard practice in these big countries, accidents such as these become more frequent. This is why we need to vote out the current minister for agriculture/fisheries and his gang as they have let our local food industries die. The greenhouses just sit there while they talk nonsense and treat this matter like it is rocket science. The marketplace looks like a third world slum. Farmers week has been killed. This fella from D7 can never get my vote in future. @?? ?, Sabrett and Nathan's have the best franks. Those are the only brand of Franks that I eat. Are they kidding or what? These people cannot be for real! Or I just wish this is a really long, bad, nightmare! Always thought they crushed bones to make them hot dogs. Sabrett is kosher hot dogs. Hot dogs are not good to eat. They contain, fish, chicken, been, pork, chicken heads, chicken feet, chicken bellies, feathers, skins, old meat, old chicken, MSG, flavouring and colouring that is definitely not good for people. Better you catch some of those yard fowls and eat before you consume hot dogs. We need to go back to creating our own natural foods. @Stopeatingit! you are right, but you forgot one thing, the bones, they crush the bones as well, hot dogs used to be delicious to me until I found out what they are made of, most process meat product is junk and chemicals, am not a vegetarian but take care with most of the things I eat. Please stop feeding children hotdogs no matter how tasty it may seem. There have been way too many health warnings.